The perfect companion to your Choice 1.5 oz. to 2.5 oz. souffle cup / portion cup, this durable, PET plastic clear lid helps to limit unsightly spills with a tight seal! Ideal for take-out applications, this lid keeps sauces or dressings contained throughout your customers' journey home, ensuring a fresh product. We order these souffle lids to fit the Choice 2oz. Clear Plastic Souffle Cups to pack toppings for our On-Demand deliveries on sundae items. They're usually made for condiments albeit but it works for what we need them for. Great price for a ton of them as well. These lids are a perfect companion for the 1.5-2.5 oz. soufflé cup! The lid stays on the cup and doesn't pop off! It is a great product! We use Choice brand for most all of our disposable plastic needs! They are the way to go for the best bang for your buck! A must have lid to go with the Choice Plastic Souffle Cup/Portion Cup. Allows control of how much dressing goes out with to go orders. Having a startup cafe, we needed all equipment for our cafe and this one is just right. This worked as expected and it's just the perfect lid. Lids are great. Work as they should in sealing portion cups well with no concern of coming loose easily. Haven’t had any defects in any cases either. We love the quality and price of these lids. They fit a nice range of souffle cups used in the restaurant and come packaged perfectly. these plastic lids cover everything I need them to. they keep food fresh and are a great size to increase storage in the fridge or freezer. A great lid for pairing with portion cups. A great seal nearly every time! Very secure, tight fit for keeping condiments contained. Clear, see through ability also a plus when selecting a prepared item. This PET plastic lid goes really well with the equivalent black plastic souffle cup. Same brand, same quality same affordable price. It's a win win situation. If you buy the 2 oz portion cups, you also need these lids! I use them to send all sorts of items in my kids’ and husband’s lunches. When I use these kids, I know the salad dressing isn’t going to spill. Great fitting lid that goes with the 2oz portion cups for side condiments. I always order an extra pack of lids as we end up losing a few to waste, etc. The Choice 2 oz. Clear Plastic Souffle' Cup Lids came in really handy for our churches fiesta plate dinner! we were able to portion Salsa, and Sour Cream in the 2 oz size it it was great! The lids secured tightly and there was No waste, no mess and people were happy that lots of hands weren't digging in the sour cream or salsa containers! These lids are great quality and go well with the containers. They are perfect for putting little containers of sprinkles into our decorate your own kits. We use them daily! I use these lids along with soufflé cups for take out salad dressing. The lid fits sturdy; no need to worry about it slipping off! You can also stack other portion cups on top. I will definitely order again! I am a personal chef and have a keto/low carb style individual meal prep service. These lids fit perfectly on the 2 oz cups to create a leak proof container! I use these cups (and corresponding cups) to separate my super mealworms. They are durable, clear, and the lids pop right on, unlike cheaper souffle cups found on another site. I recommend these to anyone else farming super mealworms! We use this lid for two different sizes of containers and love that it saves space. Occassionally a lid or two will be warped and we need to discard them. Bought the lids along with the matching Choice cups and they hold together well. No leaks or coming apart with all varieties of sauces and dressings that we use them for. I got these lids for the plastic cups that I've purchase. The lids are ok, They are kinda thin and sometimes tend to stick to each other and it kinda hard to take them apart. But other than that, they are decent and good price for the amount. Thank you for your review, Charlie! We are sorry this Choice PET Plastic Lid for 1.5 to 2.5 oz. Souffle Cup / Portion Cup - 2500/Case has not worked well for you. If you have questions, please reach out to our Customer Solutions team! Choice 2 ounces sauce cup lid. It does what it’s supposed to do. It doesn’t leak. It’s inexpensive. Sometimes two lids will stuck together but for the price I just let it double. Thank you for your review, Debbie! We are sorry this Choice PET Plastic Lid for 1.5 to 2.5 oz. Souffle Cup / Portion Cup - 2500/Case has not worked well for you. A Customer Solutions Representative will contact you soon! I would give this product 5 stars, but the missing star is due to the lid not holding up for hot liquids. We serve hot beer cheese with our soft pretzels, and this lid does not do well with the hot cheese. Other than that, would recommend purchasing. Goes along with the soufflé cups I purchased. Sometimes the lids are difficult to get onto the soufflé cups but overall its a good product. These lids are the perfect compliment to the 2 ounce clear cups. We use them all the time. They are strong and fit well. We recommend. Choice 1.5-2.5oz portion cup lids are a good product with the 2oz portion cup that we use in our restaurant. They seal nice enough where there is no spillage from our sauces. My only issue is that they stack on top of one another that it makes them very hard to separate at times and slows down our production. It can be a pain when 2-3 lids stack on each other and you have to separate them one at a time. The Choice 1.5-2.5 ounce cover for plastic souffle cup is very good size and durability for sauces and their condiments restaurants would like to use and put on the site of Dishes. Sleek black look and very durable. These lids are great for the matching portion cups. One tip I would recommend it to make sure the lids aren't sticking to each other. Sometimes that happens and you'll wonder where did all your lids go? I love the fact that these lids will fit various sizes of the little plastic cups. We used these with the 2oz portion cups and they applied easily with no hassle. These are great! The plastic 1.5 to 2.5 portion cup lids fit perfectly on the small portion cups and help to display items on the side without spilling. These lids fit tight and also fit other competitors brands that I still had in my restaurant. I am switching both the lids and souffle cups over to Choice because it will save a lot on price for all of our to go sauces in my barbecue restaurant. These lids fit perfectly on the containers they suggest for them. very secure and do not spill. I use these for a special sauce I make and I would be lost without them. These lids are used with the small plastic portion cups of the same brand. They work well, don't leak and are a good price point for our restaurant. These lids are the obvious choice for the the black plastic souffle cups. We use the cups for both dry and liquid ingredients on our to-go orders and the lids seal very well. good quality lid. easy to close and no leaks. fist perfect, its clear and clean. 100% recommended. the best price in the marker also, combine it with more items so you dont pay that much shipping.. Fits perfectly on 2 oz. cups. Never had an issue with these lids, always tightly clips on and it is an amazing price for souffle cups. Very important food kitchen item. Does a great job of covering 2 ounce cups. Makes sure none of the sauce comes out of the cup. Great lids, fit well on the 1.5 oz souffle cups that they go with. No complaints, does what its supposed to and is a great price. Easy use, but wish the plastic tops came along with portion cup. These make it easy to place homemade salad dressings, jams or condiments in customer carry-outs without wastage! Would love to see a mini-storage holder rather than plastic bag product is delivered in..! We use these lids to fit the Choice brand 2 oz plastic souffle cups. They fit, and secure well enough, but about one in every five or so lids are stuck together! At first i thought that some lids were a thinner plastic and some were thicker, but in fact they are often two lids stuck very tightly together, requiring a trained eye and delicate touch to separate them. Once you get used to it, it's not so bad, but it's still annoying when you're trying to snap the lids on quickly. Occasionally, some of the lids do not fit the cups, or vice versa, resulting in a frustrating squish of the cup. They do the job, but with a little aggravation. These lids work great and fit the indicated cups easily and securely. We use them with the containers for individual condiment and sauces. We will continue to use. Great plastic lids for my portion cups. The tops fit surprisingly well and is great for giving sauces for takeout. I would definitely purchase again. these lids are a little bit flimsy. they do a great job of sealing to the choice 2 ounce black souffle cups but are a little bit thin. These lids go perfectly with the 2oz clear plastic shuffle cup/portion cups we use. I like that they are clear PET, because many I see are hazy and then you can't see the food in them as well. The quality is better. One of my favorite item in my shop. Carrying it on top shelf for any time emergency case. For any side dressing demand, great solution. I do not use these for food service. Instead i use them along with the CHoice 1.5 oz Portion Cup (127P150C) for my homemade 100% Soy Wax Melts. They are the perfect size and allows me tu use my labels on top perfectly! This is a really well fitting lid that serves the purpose for us. We are able to keep every one of our condiments sealed and fresh! A+, item is as described. These are the perfect size for my 2 oz. portion cups that I use for to-go salad dressings. Arrived quick! Just like the matching 2 oz black ramekins these are paired with, these are great whether for to go or dine in. And these ACTUALLY FIT THE RAMEKINS AS INTENDED! They are a standard size that fits most brands 1.5 to 2.5 oz soufflé cups well. They are sturdy and stay on the soufflé cups to keep my condiments packaged and closed tell there ready to get used. Very nice, sturdy fitting lid. This lid snaps on securely and stays in place. Its a very good value for the price. Highly recommended ! Excellent small lid to use for dressing or condiments with corresponding cup. Zero leakage in my son’s lunchbox when I send him one filled with some ketchup. Very happy with this product and will definitely buy again! Have yet to receive any lids that are misformed as we have in the past with local distributor brands. Since they are disposable, cost is always a concern and they are a fraction of the price compared to our previous brand. We purchased these lids to fit the 2 ounce portion cups. They fit perfectly. There is no spillage and they keep the contents safe during transport. Great product! I reviewed the cup before but the lid and cup fit perfectly and are easy to put together. They are very sturdy and don't leak. These fit perfect on the choice 2 oz clear plastic souffle cup, secures tightly to avoid overspill. We will order these products again in the future. Love these lids. Great for insuring our condiments don’t spill or leak. Steardy and great price. I’ve order several cases of these and prefer them to any other. I bought these for the 2 oz portion cup. They are a nice fit. They are tight enough I am not afraid of them falling off, but not so tight that I am struggling to get them on. These Choice plastic lids for our 2oz portion cups are perfect! They are quality and not the cheap feeling ones. When we put them on the cups they give that clicking feeling, giving you that confidence that it's on there. This case is great price for the total amount of lids. They are used with the 2 ounce cups and completely minimize spills on your to go orders. 1 oz. portion lids. We use for our pie sampling’s. We use for sauces for our bread puddings. Sturdy. Great value. See no difference in higher priced ones. I love these universal lids. They Snap on with secure closure! We use them on our 2oz cups that contain popcorn samples and side sauces. We got these for the 2oz choice plastic soufflé cups which is says they would fit, but it's not a tight fit. There is no snap when you put the lids the whole way on and some separate from the cups when you pick up them by the lid...these kids should probably only be use with the 2.5oz cups in my opinion. As you’ve probably guessed, these snap onto the identified container sizes perfectly. I purchased these to go with the 1.5 oz cups for single-serving portions of butter, jam, etc. They work great! Along with the matching soufflé cups, we hand these out like candy all day long! For BBQ sauces; dressings; sour cream, etc. Great price on these necessities. These souffle cup lids are life savers. I have used different lids, and they have bee too buig at times these fit perfectly with the 2 oz cups i purchased! I purchased these lids to accompany the Choice 2 oz. Black Plastic Souffle Cup (Item #: 127P2B). The fit could have been a little tighter in my opinion. A few of the lids popped off during transport and a few that contained more liquid-type contents (salsa) leaked when they tipped over even though the lid was on. Overall I was happy with them and the majority remained intact. These lids fit snuggly and keep even the thinnest liquids inside. They give a nice snap when put on correctly so you domt have to worry about it rolling around in the bag and becoming loose. These souffle cup lids snap on easily and effortlessly. I like that they work on a few different sizes as well. One of the best reasons to go with Choice! Clear lid fits our 2oz. portion cup perfectly. We like having the clear lids, since we have black portion cups, which allows us to see which condiment is being served. Just like the cups, this lids fit perfect with the cups, you cant get a better value than this brand, good product at good price! I use these lids and soufflé cups for my sons lunch everyday. They have never leaked or come off the cup. They click when you lock them so you know it’s on the right way! Will continue to buy! Nice lids to fit 2oz souffle portion cups. Lids snap on easily, and aren't too difficult to get apart. We will continue to purchase this product as stock gets low. Sometimes is hard to close if you used for hot sauces. But generally is super good item. Also is hard to find the prices you get here. If you planning to used like me all the days its perfect!! These are perfect and have an excellent quality. They are both easy to secure onto the portion cups and heavy-duty enough to ensure that the condiments won't spill out. These 2 things are quite essential to fulfilling food orders quickly while ensuring that the food will get to its destination. The Choice PET Plastic lid works great on the Choice 2 oz plastic cup. We use the lid to cover our portions of bbq sauce, ketchup and pickles for to go orders, I will continue to order these lids. We use these kids on our 2 oz portion cups to package sides of ketchup, butter, mayo etc. kids fit the cups nicely and are cost effective! We use these souffle lids for the souffle cups that we put butter pats into. The quality is good. They fit well on the cups and we would recommend them. The Choice PET Plastic Lid for the 1.5 oz to 2.5 oz Portion/Soufflé Cup are thin and feel flimsy. However, the quality is far better than one would think. this lid seems so fragil but it is not! i like that it is transparent and you can see whats inside. plus it closes really good and no leaks! I have used these on the 2 and 2.5 oz black bottoms. They fit great with no leaking and hold up well and are priced great for home use. We use these with the black soufflé cups... they are a perfect combo, because you can see through the top to see the kind of dressing, but the black cup makes it look a little bit dressed up. No issues with ill fitting kids or anything of the sort. These have yet to fail us with any base that we have chosen to use with them (clear or black). Inexpensive and so worth the money. This lid fits two different sized portion cups it’s great for saving any unused condiments or storing mini chocolate chips or raisins for a small snack. These Choice Soufflé lids match up with 2 oz soufflé cups! 100 lids comes in a pack and they are great for containing spices, sauces, condiments etc. In fact, these lids compliments 1.5-2.5 oz soufflé cups! They are good quality at good prices. Choice is a trusted brand! We recommend and would purchase them again! Two thumbs! The lids fit the corresponding cups well. They snap on tightly and they fit well enough that they keep the product from spilling if they get tipped. If you pair these lids with the coordinating 2 oz soufflé cups, you can’t go wrong! I use them to send hummus, peanut butter and dips in my kids’ lunches. The lids really make the containers air-tight! These hAve been good to us so far. They fit on any portion cup we have bought and have a nice tight fit (somethines even a bit too tight). This is a very strong and very good lid to use it on cups because of the weight, it holds onto the cups really nicely. Sturdy lid and goes on pretty easy. I like to pre-prep the cups for quick serve and go on fish fry day. The see through lid make it easy to get the right product. I purchased these container covers for the matching containers. They are super sturdy, easy to wash and have a nice tight seal. A great thing to have in your cupboard. We use these 1.5 oz portion cup lids for all our dips and wing sauces. They are very well made and the price is excellent. No worries on spillage!! 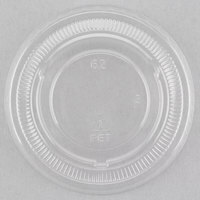 These small portion cup lids are an inexpensive option for a plastic lid. Perfect for condiments, dips, or dressings. These hold securely to choice brand portion cups preventing spills and leakage. This is a great product for our business. These used to be a lot more sturdy but they still do the job. I would recommend this product and the Choice line to anyone. The Choice lids fit my containers perfectly. They have a good seal, the quality is excellent. They are much cheaper than our local restaurant supply store. I would definitely recommend these lids. These Choice plastic lids fit souffle cups that are 1.5 oz to 2.5 oz. These are BPA-free and recyclable and come in a pack of 100 count. These lids fit perfectly on the coordinating portion cups (I use them on the 2 oz. black cups) and looks really great. I find them to be much better than others I have tried in the past, they hold liquids like dressings and sauces very well, no leaks! The lids are crystal clear, which shows off what's inside really well, and they compact and lightweight, perfect. They do seal to the cups well, however the design on the lid doesn't allow cups to stack on top of each other as well as the Solo lids. Thank you for your review, Michael! We are sorry you did not prefer these lids, if you have questions please contact our Customer Solutions team! Im currently using these paired with the Choice 2 oz cups and so far they have been great! I have used many of these cup/lid combos in the past and these work just a good as any more expensive name brand! I use them almost daily for condiments, sauces, and dressings, and they hold my liquids in just fine! 4 stars only because sometimes they aren't cut completely evenly and have extra plastic around some of the sides... doesn't effect the functionality, but bugs me when i'm using them for something other than my family's lunches. Also, some other brands i have used in the past seem to melt and warp when holding hot liquids, but so far so good with these! I will continue to use the Choice brand from now on! Great buy! It is easy to put on the cup and it is very secure. Good quality of plastic and very clear too. Will purchase again and recommend! lids snap right on, but don't try and use them with any other brand of souffle cup, they wont fit right. They also stick together, so in a fast paced kitchen they are sometimes difficult to handle. these portion cup lids fit great. they give you a nice tight seal. there is no need to worry about your sauce or dressing out leaking with these! We love these lids. We use them for our sauces in the lounge, large banquets, and takeout orders. They are easy to use and go on the cups easily, but stay on to prevent spills. You can't have to many products that help with portion control. They are always good to have on hand whenever you need to give a side of something with A lid. I highly recommend this product. These are not great. The quality is much flimsier than the Dart brand. Stacking them 4 or 5 high is risky and we have dropped more of these than we wanted. I would say stick with the Dart brand for just a couple dollars more. These lids and containers are perfect for smaller portioned items like dressings and sauces. Do not spill easily and they are a great price as well! These fit perfectly and are great to transport food items and not have to worry about the tops falling off or spilling in the floor! Will order again! These lids matched the cups perfectly. I made clear, laxer printed labels for the various flavors of salad dressing so my guests knew what to choose from. When i order the cup that fits these lids..the option of these and another lid comes up which s great and saves me time. I choose these over the less expensive ones because they fit perfectly with my labels. They are a wonderful tight snap fit and I am very pleased with the whole combo. We use these lids on the cups for salad dressings and oils and none of them leak. We were so nervous about the purchase, but tested them and they held up great. Great lids for the cups, had no problems fit exactly how we thought they would. Will definitely be purchasing again in the future. Thank you! Nice tight lid. Holds product in well, but not hard to remove for older people and children. Perfect size for condiments and dressings. These are a staple in any operation. The clear and clean look make every one happy to see the content. It fits perfectly and easy to snap to the cup without spilling.Always keep them in stock. I get these portion cup lip to go with my cup.i dont have to worry about them falling over and spilling anything.They are very sturdy and the price is good. Tops work very well to cover our pickles . Never had a complaint about leakage. Super product! Our customers enjoy having all of the items on our menu, as a takeout meal. A must have for a two ounce portion cup. It is a sturdy, reliable lid, which keeps foods fresh. A great price for this product. The cups got here on time and were in good shape! They've got my future business as I launch this new organic frozen dog treat ! Was so happy to try these out. Nice that I could buy in smaller quantities.Very practical item for to go orders. We will be back for more in the future. Great portion cup lids, purchased to use with the 2oz clear portion cups to use for salad dressing. Lids snap on tight as you can see in the pic, so no spillage there. These are perfect for what I needed them for & cost less than at the "big box" stores. Would definitely buy these again. Very sturdy. these make traveling a breeze!! I put my jello shots in thebig cups cause these tops are huge!! they make great accessories to the shot cups!! Great little covers that fit snugly on the portion cups also sold at webstaurant. These are perfect for dressing and sauces to go, really sturdy, we never have to worry the lid will come off. These lids worked very well with the cups for serving condiments when feeding a large number of people. Also good for individual servings of salad dressing. we use the portion cups at a concession stand to "portion" cheese sauce. We can dish up a #10 can, and add these lids. then the cheese sauce can be chilled until needed. These lids are perfect for the clear plastic cups. They give a professional finishing touch. They seal very nicely without leaks. I do recommend if you buy the plastic souffle clear cups to get these lids. Great product! The lids make stacking my soy shots a breeze! My labels fit perfectly in the center of the lid. Purchase quantities are perfect for those just starting out. Perfect fitting lids for the 2 ounce souffle cups. These work great for the optional to-go frosting that I offer to my cinnamon roll customers! As I said in the other review I just posted, the black portion cups added a lot of class to last year's holiday Cookie Weekend. In the past, storage of our sprinkles for the night consisted of precarious piles of trays of motley size containers covered with wax paper sheets. This year we ordered the black 2oz portion cups AND the clear lids to go on them. Talk about easy! Snap those lids on for the night and everything is safe and tidy. I am so glad we got the lids, too. No more worries about losing everything if a tray slides off the stack (and with all containers the same size, there is less chance of a slide). And in terms of household use, the cups and lids are sturdy enough to stand many washings. What great products. This lid fits very snugly so no spills. Goes perfectly with the matching Black Plastic Souffle / Portion Cup. Clear lid lets you see what you put inside so no mix ups. right size, enough portion for dipping sauce. I can use it as a dipping sauce bowl while we go out picnic or give to customers for their appetizers. they all love how convenience this thing are!! I love these. From daily use of dressings for lunches, to dips for dinner, to Jell-O shots for party. Very versitile, and better for you size for portion control. I love this item, I go through it the most!! the covers make sure nothing leaks and I use them for dressings and fill them with tuna for salads! They are awesome!